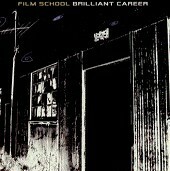 Slow, building, and methodical, Film School's intelligent rock hybrid delivers the skull-crushing dynamics of a fast, loud indie rock band with the smarts and charm of the lo-fi pop counterparts, blending the two into a rich, simmering pot of twisted, left field rock. Sonically textured and based around each instrument as they all build on each other, the album delivers strong performances track after track, leaving your mind pulsating, your heart beating furiously, and your head spinning. What more could you want? I'll give it an A.